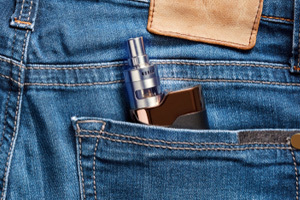 LARCHMONT, NY – According to abc7ny.com, a man suffered severe burns on Monday morning when the battery in his e-cigarette exploded in his pocket. The incident took place in Westchester County, New York. The Larchmont police were called to the scene of the incident at about 8:30 in the morning and arrived to find the victim with severe burns. The victim was identified as Jacob Dudhnath, 27, had arrived at his job when the device exploded. Dudhnath said that his pants caught fire and a co-worker stated that they had to tear the burning pants off of the victim. Kevin Carrelli, who works with the victim, said that there was a two-foot flame coming out of Dudhnath’s pants. Carrelli said that he injured his hand trying to help the victim out of the burning clothing. Burn marks were left on the asphalt at the worksite where the incident took place. Dudhnath works for a heating and plumbing company, and he and Carrelli had just arrived at a home they were to perform work on in Larchmont. Dudhnath has a 6-month-old child. He reported that he would likely quit vaping following the accident. Dudhnath is not the first man to be injured by an exploding vape pen. Last may a man in Florida was killed when his vape pen battery blew up while he was using the device. In that incident, the pen sent shrapnel into the victim’s head like a bullet. While battery explosions are statistically uncommon, the US Fire Administration reports that 195 e-cigarette explosions and fires occurred between 2009 and 2016, 133 of which led to injuries. Have you or a family member been injured by an exploding e-cigarette?